Scented. 7 pcs per pack. Nikko packs a whole lot of intricate detail into this tiny bait to fool the most finicky and wary of fish. 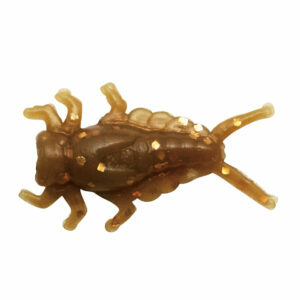 Great for fly fishing native trout, ice fishing or simply put on a small jig head. Nikko’s mayfly nymphs are probably Nikko’s most famous small bait and has a stellar reputation around the world. Super stretchy. These baits will not tear easily, and will last through many fish and multiple uses. Biodisintegratable. Phthalate and toxin free. Store in the provided plastic case.